Turtle Quest in Turquoise Waters – Marvellous creatures of nature! With a number of conservation programmes and with efforts of the government in protecting the natural ecosystems around the Maldives, The Turtle population in the region is steadily rising. Read on to know more about turtle conservation and about some of the varieties of these creatures found around the archipelago. Declared as a protected species under the environment law of the Maldives, hunting or harming these creatures are strictly prohibited and one could face serving penalties and even imprisonment upon inflicting any sort of damage to the turtles. Below are few turtle varieties which you could spot during your time in the Maldives. Green turtles are one of the most commonly found turtle species in the seas surrounding the Maldives. They mostly feed on algae and seagrass and the green pigment in their diet gives the turtle their distinctive green colour hence their name. An adult turtle can weigh up to 400 pounds and can grow up to 5.5feet in length. These turtles are green and grey and their shells are heart shaped. They can weigh up to 100 pounds and grow up to 3 feet in length. These turtle’s diet consists of small crustaceans and jellyfish and also will adapt to vegetarian diets if nothing else is available on the menu. Leatherbacks are the largest turtle species found in the seas surrounding the Maldives. An adult turtle can weigh up to a whopping 2000 pounds and could grow up to seven feet in length. There are also two other species of turtles such as the Hawksbill turtle and the loggerhead turtle which live in the Maldivian waters. You could spot these amazing creatures by joining a diving excursion which can be arranged at many of the Maldives luxury resorts the likes of Amaya Kuda Rah Maldives. 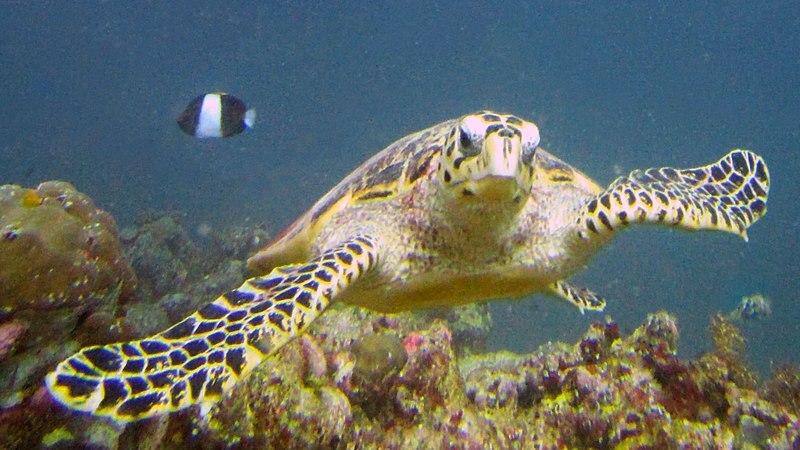 You could even spot one while snorkelling in the waters surrounding your resort if are lucky.